Commonwealth bronze medallist Katie Archibald is targeting an Olympic gold medal at Rio 2016 as part of Great Britain's women's pursuit team. The 21-year-old from Milngavie, near Glasgow, returned from the European Championships in France last month with three golds - one in the team pursuit. "I feel good about training and how I've been performing at races so I hope it's going to pay off," she said. 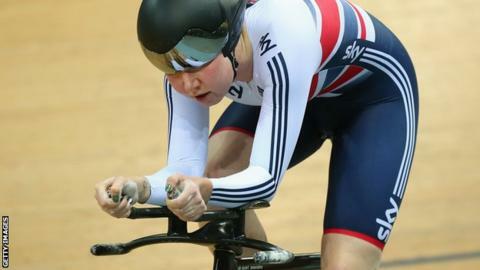 "Everything I ever do will be to try to win that team pursuit medal." Having excelled in the Scottish cycling scene, Archibald moved to Manchester in 2013 when she became part of the British Cycling set-up. She admits to missing home and her old Scotland team-mates but is happy in England's north-west and very pleased to be benefiting from "the fantastic riders here and a bigger well of expertise". Archibald trains with Laura Trott, Elinor Barker, Joanna Rowsell Shand and Ciara Horne at the city's velodrome and admits it took her a while to get used to the place. "The first time I walked in here was for the Junior Nationals in 2012 and I remember the feeling in my stomach," she told BBC Scotland. "I expected there to be dramatic music! "It struck me the other day that I'm desensitised to the glory of it all. I guess I'm a bit sad that I've lost that sparkle but it's working me hard. "It's a strange world because you know that it's nothing that you ever dreamed you'd be doing yet there are 20 people around you who are doing the same thing. There's a lot of pressure." Having overcome any initial feelings of being overawed by her surroundings, Archibald is now an established part of the GB pursuit team that won the World Championships in 2014, clinched silver this year and are the current European champions. In October's European Track Cycling Championships, she won gold in the individual pursuit and elimination race as well as gold in the team pursuit. "We basically live in each other's pockets yet are still meant to be able to give relevant criticisms," she said of her relationship with her team-mates. "You'd think that would be quite tricky but we get on ridiculously well. "There are five of us and there are usually four spots, which seems like a recipe for disaster, but I think it just pushes you on. "The ultimate target is against every other nation in the world, not against each other, so we're kind of held together by that. "I'm more motivated by being in a team environment. This team has pushed me on to another level because there is that extra expectation. There are people to chase and people chasing you. "It builds this really good ethos to get the best out of people." While Rio and team pursuit goal is the ultimate target, Archibald is also competing in road races, though she says that is "more of a supplement" at the moment. Her diverse training programme as an endurance rider includes track, road, gym and turbo trainer sessions. In 2017 she expects to place greater emphasis on European road races than track competition. And a longer-term goal might be to step up from her current position as reserve rider to Trott for the omnium in Rio to be first pick in that discipline at the Tokyo Olympics in 2020.